Completed a FireBike course? You’re entitled to 10% discount on your motorcycle insurance with Devitt! Essex FireBike is all about making you a better rider through improving your skills, reactions and enhancing your road knowledge, especially with the increased vulnerability motorcyclists have as road users. FireBike offer a range of rider improvement courses throughout the year regardless of what you ride, how long you’ve been riding and the experience you already have – there’s always room to learn something new! That’s why we want to reward those of you who have taken the time to improve your riding skills making you a safer and more conscious rider. Devitt have teamed up with FireBike Essex and are offering 10% discount on your motorbike insurance if you’ve completed one of their courses. FireBike is Essex County Fire & Rescue Service’s motorcycle safety initiative through which they engage positively with Essex’s motorcyclists to promote safer rider and reduce the number of motorcycling casualties in Essex. The FireBike team members are all RoSPA Gold qualified advanced motorcyclists and also RoSPA Advanced Motorcycle instructors. What is a Better Biking course? The half day Better Biking course is focused on giving advice, guidance and comprehensive feedback that will help further your riding skills and knowledge. The day will start with a classroom session followed by an assessed ride with the FireBike team, they will provide practical advice and guidance on your riding that will highlight your strengths and suggestions for improvements. Full feedback will be focused on areas including; observation, hazard perception, positioning, gear selection and overtaking. Once you’ve completed the course, you’ll be given full feedback by your FireBike instructor along with a certificate and goody bad. What is the Advanced Machine Skills course? The Advanced Machines Skills course is to help further your riding ability, no matter what you ride, how long you’ve been riding or what experience you already have. The course would normally cost £115, but it’s completely free to take part in! 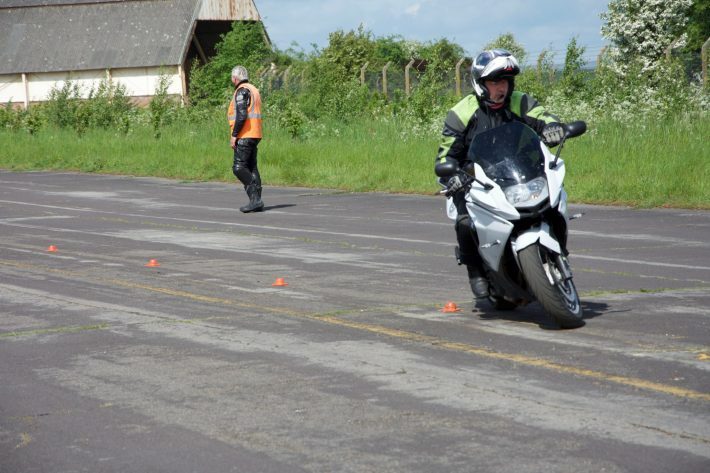 This intensive one day course at Wethersfield Airfield is delivered by a group of highly skilled and experienced riding instructors. The course is all about sharpening up your key skills, which are rarely practiced by some but help will reduce the chances of collision. Interested in taking one of the FireBike courses? Well, it couldn’t be easier to book onto a course. All you need to do is email Firebike@essex-fire.gov.uk with your full name, address, contact number and bike make, model and registration. What is the Safer Essex Roads Partnership? Safer Essex Roads Partnership consists of three local authority areas including Essex County Council, Southend-on-Sea Borough Council and Thurrock Council to promote and provide road safety services to the road users of Essex. Stats provided by Essex Police in 2015 showed that 197 motorcycles were killed or seriously injured on the roads of Essex; even though motorcyclists only make up less than 1% of total road traffic, they make up 26% of overall KSI. With these shocking figures, Essex County Fire and Rescue Services have created a partnership with Safer Essex Roads to help reduce these numbers. So you’ve completed a FireBike course? Claiming your 10% discount on your motorbike insurance couldn’t be easier; all you need to do is simply click the ‘Get your discounted quote’ button in the banner above and you’ll be taken to our dedicated FireBike quote system. Your 10% discount will be automatically applied to this quote. This offer is for new insurance quotes only, it cannot be applied to existing policies. You must get a quote directly for Devitt (not through a comparison site or recalling a previous quote from a comparison site) by using the dedicated link, otherwise your 10% discount will not be applied. You must provide copies of your training certificates to us once you have purchased your insurance. Alternatively, call our contact centre and inform one of our helpful advisors that you have come via FireBike course to obtain your discount. The discount cannot be taken on quotes obtained through a comparison site.